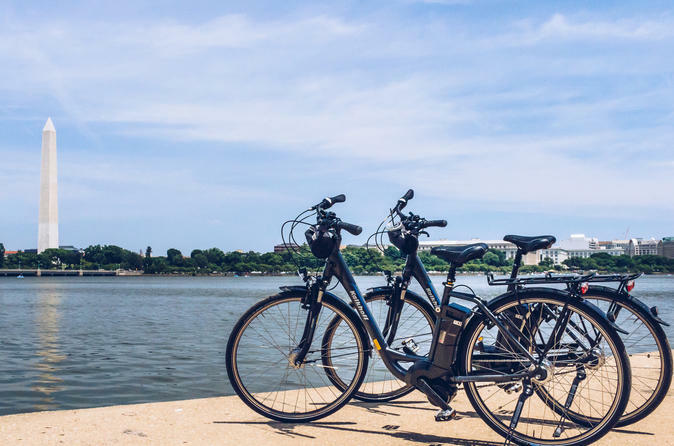 Maximize your time in DC by visiting more of the city's best sites on this new e-Bike adventure! This 5 hour adventure will take you to Washington's must see sites including the National Mall, Capitol Building, Lincoln Memorial, Tidal Basin and more! You'll ride in comfort on an electric bike as you zoom through history with your fun and knowledgeable tour guide! With the help of the e-bikes, we'll cover a lot of ground in a small amount of time. These e-bikes have a small motor to help power you, meaning you'll be able to go farther with less effort! Join us in D.C. to see the best of the Nation's Capital. We'll cruise down Pennsylvania Avenue, around Capitol Hill, all while soaking in sites like the Capitol Building, Union Station, Library of Congress, and the Supreme Court. We'll take a brief stop for lunch (cost not included, please bring cash or credit card or you are welcome to bring your own packed lunch) we'll pedal by the Smithsonian Institution and Washington Monument on our way to the hub of memorials and monuments dotted along the National Mall and Tidal Basin. We give you plenty of time at each stop to hear fascinating stories and anecdotes from your tour guide, and of course take some photos. Please note that while we do stop for lunch, the cost of lunch is not included.